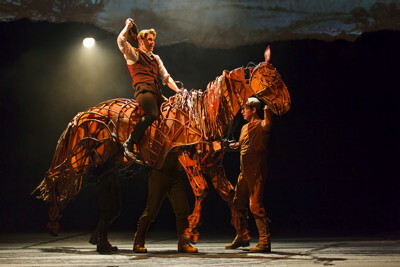 War Horse, the spectacular stage show that captivated Steven Spielberg, is now playing at the Ahmanson Theater in Downtown LA until July 29, 2012. A unique theatrical experience that combines intense drama with elaborate staging and dazzling puppetry, War Horse is essentially a love story between a boy and his horse. At the heart of the show are full-sized puppets that thrillingly bring breathing, galloping and charging horses to life on stage. A stunning element of the show is the animated projection (by 59 Productions) that depicts the horrors of war in a powerful and stylized fashion. 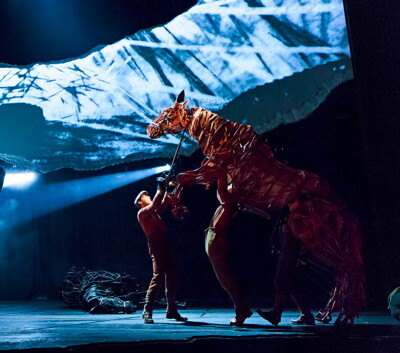 Young adult fiction writer Michael Morpurgo’s best-selling 1982 novel War Horse was first adapted for the London stage by playwright Nick Stafford, in association with South Africa’s Handspring Puppet Company. The production received its world premiere at the National Theatre of Great Britain’s Olivier Theatre in 2007, and returned to the National in 2008-2009 before transferring to the West End’s New London Theatre in spring 2009. Blending modern and traditional storytelling, and combining the epic with moments of intimacy, Morpurgo’s tale is a study of hardship, endurance and love. It’s a World War I adventure in which a teenaged Devon farm boy named Albert (played well by Andrew Veenestra) loses his cherished horse Joey to the British cavalry and war machine and then embarks on an unlikely odyssey to find him again. The magic of the show lies in these intense relationship between the characters and the horses, beautifully rendered by the expert handlers. The two main horses in the show, Joey and Topthorn, are each operated by a trio of puppeteers. 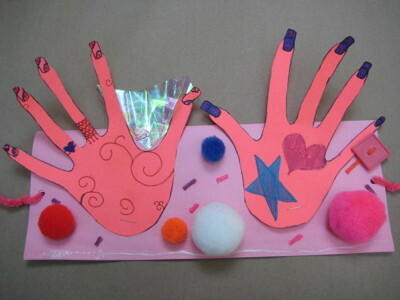 (There are also three separate teams of these trios.) So each night’s performance by the horses are as unique as that of the actors. 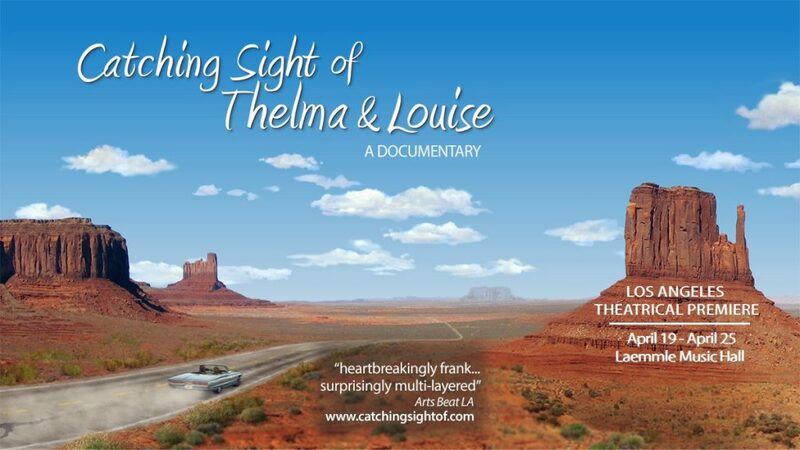 This story about redemption and survival is set against an almost romantic, poetic backdrop. Indeed, there is a romance to the First World War because while it was the most horrific episode humans had known, out of it came poetry and harsh lessons. The greatest enemy proved the Great War itself. The stage show features a large ensemble of characters (a cast of close to thirty players) and there’s a sense of balance in how the horse touches the lives of so many people in much the same way that those four years of horrendous trench warfare changed and affected a whole continent of people. More than pure spectacle, the beauty of War Horse lies in its classic storytelling. Michael Morpurgo’s simple and beautiful tale somehow encapsulates the essence and profundity of the human condition. In the figure of Joey, a sensitive horse, audiences will find nobility and perseverance, strength and dignity in the face of horror. If you can, try to be seated on the aisle at house right. It was so thrilling to have Joey thunder right past me! Runs until July 29, 2012 matinee. Tues-Fri 8 pm, Sat 2 and 8 pm, Sun 1 and 6:30 pm, Thur 2 pm on July 5, 19, 26. 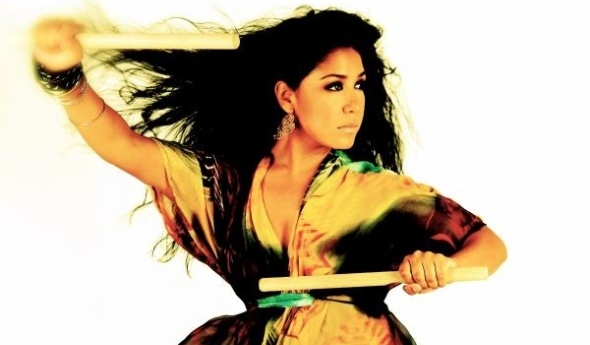 Purchase tickets here or call 213-972-4400. $20.00 Hot Tix may be purchased in advance or, subject to availability, on the day of performance at the box office (no checks).